A bitcoin Exchange-Traded Fund (ETF) would be massively bullish for bitcoin’s price. It would further legitimize bitcoin and would allow several asset managers, currently precluded, to participate in the asset class. The CBOE bitcoin ETF proposal is vastly superior to prior ETF proposals, and addresses most of the concerns the SEC has expressed when rejecting prior ETF applications. Yet the SEC’s key concerns remain: underlying bitcoin markets are not demonstrably resistant to manipulation, and are mostly unregulated. An ETF needs to require rules to prevent manipulative practices. For this, an exchange must have sharing agreements with significant markets for the underlying commodity, and those markets must be regulated. However, one of the SEC commissioners has already expressed support towards a bitcoin ETF. My assessment is that it is feasible the SEC will decide the CBOE ETF proposal does satisfy requirements — even if it doesn’t. It should be a long process. I do not expect the SEC to reach a final decision before the final deadline, which is Feb/27/2019. Why an ETF is a game changer. Estimating the price impact of a bitcoin ETF. SEC concerns regarding bitcoin ETFs. Advantages & shortcomings of CBOE proposal. Comparison with CME & CBOE bitcoin futures. An SEC commissioner supported the Winklevoss ETF. ETFs are exchange-traded funds whose shares track the price of an underlying asset (e.g. commodities such as gold) or underlying basket of assets (e.g. components of the S&P 500 index). ETFs are popular investment vehicles for a myriad of reasons. One of the key advantages of commodity backed ETFs is allowing investors to not worry about custody of the underlying assets (bitcoin here represents a commodity), as the ETF takes care of custody. Back to bitcoin, institutional investors in particular are generally uninterested in buying bitcoin precisely because of the associated custody issues. As an alternative to physical bitcoin, investors could buy bitcoin futures, financial derivatives based on bitcoin which require no custodianship. Yet futures need to be rolled over every time a futures contract expires, which is cumbersome, costly, and results in a taxable event. Furthermore, smaller asset managers such as corporate pension plans are precluded by mandate to buy futures directly — all futures, including bitcoin futures. A bitcoin ETF would thus create a new investable asset class for many institutional market participants. A game changer! This game changer needs to first be approved by the U.S. Securities and Exchange Commission (SEC), the US regulator overseeing securities. How big of a price impact could a bitcoin ETF have? I’ll use the case of gold to come up with an estimate for bitcoin. The total gold market size is estimated at 188,268 tonnes (World Gold Council, Dec/2017). The gold market is composed of five sectors: Jewelry, Official Sector (i.e. central banks), Bars and Coins, ETFs and similar, and Other Fabrication and Unaccounted. For simplification purposes, one could argue gold ETF and Bars and Coins are the two strictly speculative categories. Given that the gold ETFs market size (2,158 tonnes, or $75 billion at current gold prices) represents 5.6% of the Bars and Coins market size (38,444 tonnes), one could then theorize that the creation of a bitcoin ETF may attract an influx of $6,7 billion into the bitcoin markets (that is, 5.6% of the bitcoin current market cap of $120 billion). 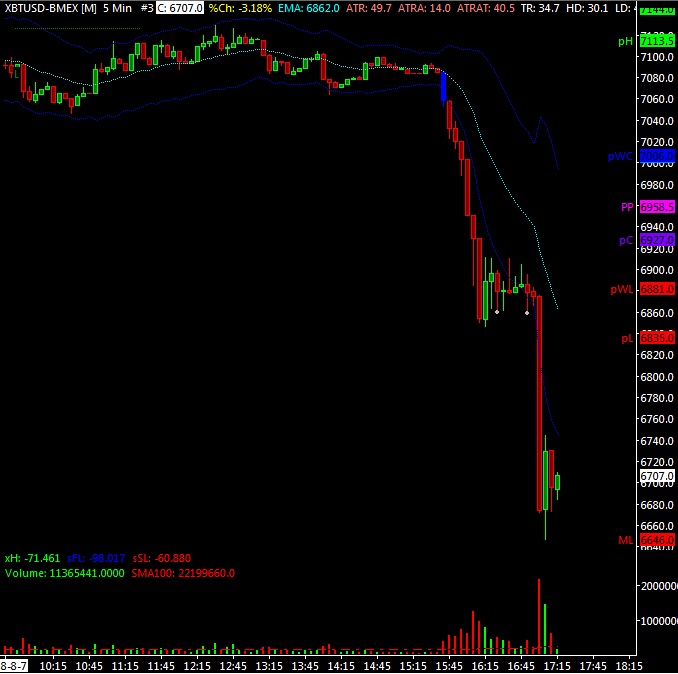 Then comes the question of how much of an impact would that influx have on bitcoin’s price. The relationship is not 1 to 1. Cheesman and Burniske, in their piece “Cryptoassets: Flow & Reflexivity”, called that relationship the fiat multiplier, and estimated a multipler in the 2x–25x range. In other words, an influx of $6,7 billion would have a considerably larger impact on price because of investor’s feedback loop and associated price momentum. By applying a multiplier of 13.5x (the median of such range), the 5.6% fiat influx would result in a 76% price increase. 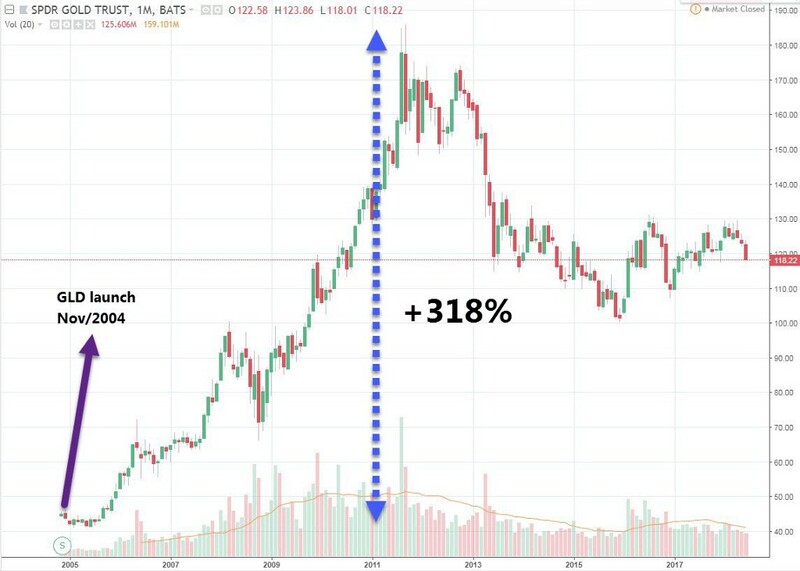 Another approach is looking at the price of gold after the inception of the first gold-backed ETF in the United States, $GLD, on Nov/18/04. Gold skyrocketed soon after, clocking a 318% increase in approximately seven years. However, it is important to bear in mind there was a strong monetary policy component propelling gold prices upwards at the time. Bullish factors aside, several asset managers are precluded from buying or transacting in bitcoin by mandate, because of bitcoin’s high relative volatility and the perception by many of bitcoin as a Ponzi scheme. An ETF would NOT address these issues, at least not in the short term. However, it would progressively address both in the long run — by making bitcoin more liquid and thus less volatile, and more widely accepted among institutional circles. It should be noted that US institutional players could already be offering long or short exposure to bitcoin via an ETN with futures as underlying, just as some offer exposure to VIX with futures as underlying. Yet it is not happening. Why? Simple: perceived demand/profits are not large enough to secure mandates. The so-called “CBOE bitcoin ETF” is a physically backed bitcoin ETF proposed by the CBOE exchange (physically backed = when investors buy shares, the fund buys tokens). It has been all the rage since late June, fueling a 40% price increase from the year lows (even though in the last week it retraced 60%). It requires the approval of the SEC. And the SEC has a long history of rejecting bitcoin ETF proposals, with the “Winklevoss bitcoin ETF” standing out as the most famous one. Many believe the SEC will approve the “CBOE bitcoin ETF” because the CBOE is a very serious institution. Even though true, that conclusion is based on a false premise, because there actually is no such thing as the “CBOE bitcoin ETF”. To be accurate, the CBOE BZX Exchange made a proposal to the SEC to list SolidX Bitcoin Shares issued by the VanEck SolidX Bitcoin Trust — just as in 2016/7 it was the Bats BZX Exchange proposal to list Shares of the Winklevoss Bitcoin Trust. To compare apples with apples, we should be talking about the CBOE BZX proposal vs. the Bats BZX proposal, or the VanEck ETF vs. the Winklevoss ETF. Furthermore, in March 2017 the CBOE acquired Bats. Hence, presumably the people behind the CBOE proposal are about the same as those behind the Winklevoss ETF. It should become clear that the CBOE proposal is not more reputable because of the CBOE name. Finally, the listing exchange is the same: the BZX Exchange for US equities. I will from now on refer to the “CBOE bitcoin ETF” as the “CBOE proposal”. Trust/Fund Issuer/BTC Custodian: VanEck SolidX Bitcoin Trust. Marketing Agent: Foreside Fund Services. The Trust issues baskets of ETF shares to Authorized Participants, upon Authorized Participants placing an order to buy. Each basket consists of 5 shares. Authorized Participants are registered broker-dealers and FINRA members, and/or participants in Depository Trust Company (DTC — a trust company which performs the functions of a Central Securities Depository). Authorized Participants deliver cash payment to the Trust’s Cash Custodian. Authorized Participants sell shares on CBOE exchange. Trust purchases bitcoin from bitcoin counterparties (OTC and exchanges, both). The MVBTCO index represents a bitcoin price derived from constituent bitcoin OTC platforms that have entered into an agreement to provide such information. This index is used to calculate the Trust’s Net Asset Value (NAV). The Trust intends to trade bitcoin in the OTC market, with the OTC platforms that comprise the MVBTCO Index. The Sponsor expects that it will be more cost efficient to trade in the OTC market rather than on a bitcoin exchange. The Trust therefore expects to conduct most of its trading OTC, primarily on the OTC platforms that comprise the MVBTCO Index. These are all U.S.-based entities. The Trust would trade as well with the following cryptocurrency exchanges: Bitstamp (Slovenia), GDAX/Coinbase (California), Gemini (NY), itBit (NY), bitFlyer (NY), and Kraken (California). All counterparties comply with state and/or U.S. AML &KYC regulatory requirements. The CBOE proposal indicates that bitcoin counterparties include entities that are regulated by the SEC and FINRA as registered broker-dealers and affiliates of broker-dealers. As of right now the only FINRA member seems to be Genesis Global Trading, an OTC trading entity. Coinbase would soon be a SEC and FINRA registered broker-dealer, although it is not yet one. In 2017 the SEC rejected two bitcoin ETFs, while in early 2018 multiple firms withdrew ETF filings, upon the SEC questioning whether the proposed ETFs could comply with various rules. One of the two ETFs rejected in 2017 was the famous Winklevoss ETF; its rejection was appealed, and just recently the SEC rejected it again. 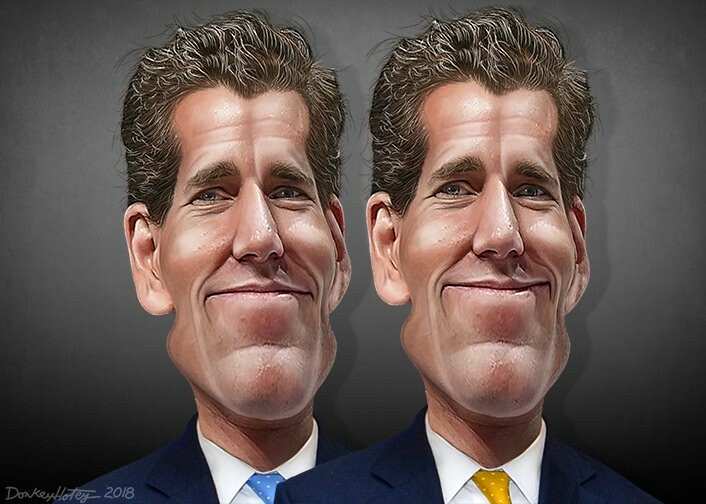 Bitcoin pioneers Winklevoss Twins — Caricature — Copyright by DonkeyHotey. The SEC rejected the Winklevoss ETF on grounds that the proposal was inconsistent with Section 6(b)(5) of the Exchange Act, requiring rules of a national securities exchange designed to prevent fraudulent and manipulative practices and to protect investors. The SEC argued that to be consistent with Section 6(b)(5), given that bitcoin markets are not resistant to manipulation, the listing exchange must enter into surveillance-sharing agreements with a significant bitcoin market, which must be regulated. The Commission agrees that, if BZX had demonstrated that bitcoin and bitcoin markets are inherently resistant to fraud and manipulation, comprehensive surveillance-sharing agreements with significant, regulated markets would not be required, as the function of such agreements is to detect and deter fraud and manipulation. But because the underlying commodities market for this proposed commodity-trust ETP is not demonstrably resistant to manipulation, BZX, as the ETP listing exchange, must enter into surveillance-sharing agreements with, or hold Intermarket Surveillance Group membership in common with, at least one significant, regulated market relating to bitcoin. Finally, the SEC stated that any surveillance-sharing agreements are with bitcoin-related markets that are either not significant, not regulated, or both. Finding that BZX has not demonstrated that bitcoin and bitcoin markets are inherently resistant to manipulation, the Commission subjects the proposal to the analysis it has historically used to analyze commodity-trust ETPs, focusing particularly on whether there are comprehensive surveillance-sharing agreements with significant, regulated markets. Because adequate surveillance-sharing agreements are not in place — and any current surveillance-sharing agreements are with bitcoin-related markets that are either not significant, not regulated, or both — the Commission concludes that the proposal is inconsistent with Exchange Act Section 6(b)(5). 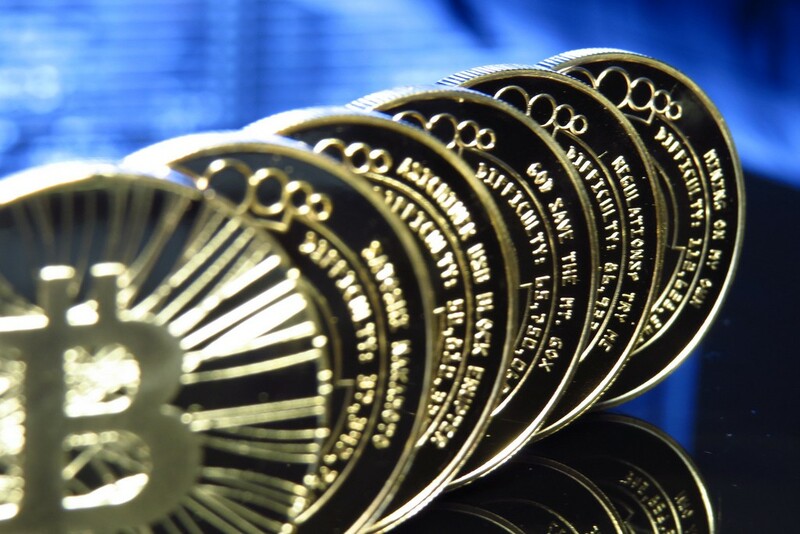 The Commission believes that the significant markets for bitcoin are unregulated and that, therefore, the Exchange has not entered into, and would currently be unable to enter into, the type of surveillance-sharing agreement that helps address concerns about the potential for fraudulent or manipulative acts and practices in the market for the Shares. In its proposal BZX contended that the SEC approved the streetTRACKS Gold Shares ETP even though the spot gold market were largely unregulated. Yet with the Gold order the SEC determined that “the unique liquidity and depth of the gold market, together with the Memorandum of Understanding with NYMEX/COMEX (gold futures market) and NYSE, created the basis for the ETP listing exchange to monitor for fraudulent and manipulative practices in the trading of the Shares”. Bitcoin markets on the other hand are, at present, considerably illiquid and accordingly volatile. In January 2018 the SEC sent a Staff Letter on Fund Innovation and Cryptocurrency-related Holdings, identifying questions it would want satisfactorily addressed by ETF proposals. Valuation: ETFs must value their assets each business day to strike a net asset value (“NAV”). Can this be achieved given cryptocurrencies’ volatility, fragmentation and lack of regulation of underlying markets? Liquidity: ETFs must maintain sufficiently liquid assets to provide daily redemptions. What steps would funds take to ensure they would have sufficiently liquid assets to meet redemptions? Custody: Funds must maintain custody of holdings. How would a fund satisfy custody requirements? How would a fund validate existence, exclusive ownership and software functionality of private keys? To what extent would cybersecurity threats impact safekeeping of assets? Arbitrage: An ETF is required to have a market price that would not deviate materially from its NAV. In light of the fragmentation, volatility and trading volume of the cryptocurrency marketplace, how would ETFs comply? How would volatility-based trading halts on a futures market impact arbitrage? How would the shutdown of a cryptocurrency exchange affect it? Manipulation: Cryptocurrency markets feature substantially less investor protection than securities markets, with greater opportunities for fraud & manipulation. Is the ETF appropriate for the wide range of investors, including retail investors? Would investors have sufficient information to understand the risks? Protecting investors, retail investors in particular. Impact of volatility & fragmentation on the preceding issues. The CBOE proposal is vastly superior to prior ETF proposals — it is more detailed and addresses most of the issues the SEC has expressed regarding bitcoin ETFs. Protecting retail investors: by having its per-share price equivalent to 25 bitcoin, the ETF would be cost-prohibitive for smaller retail investors — note this reduces the ETF’s bullish impact as it reduces its addressable market size. Insurance: the ETF would have $25 million in primary coverage and $100 million in excess coverage, with the ability to increase coverage depending on the value of bitcoin held by the Trust, with the goal of maintaining coverage at a one-to-one ratio. On the other hand, the Winklevoss ETF had no insurance coverage “due to insurers’ lack of understanding and sophistication with respect to Digital Assets”. Valuation: the Trust’s NAV would be calculated using the MVBTCO Index, which relies on prices from several OTC market participants. This should be seen as a superior approach (less prone to manipulation) than relying solely on Gemini Exchange prices, as the Winklevoss ETF planned to do. Custody: although not addressed directly in the CBOE proposal, custody solutions are nowadays superior than in 2017. The CBOE proposal attempts to convince the SEC that manipulation is a non-issue, by means of sentences such as “bitcoin is not particularly susceptible to manipulation” and “it is generally not possible to disseminate false or misleading information about bitcoin in order to manipulate”. That could not be further from the truth. For example, wash trading, a form of market manipulation in which a market participant simultaneously sells and buys an asset to create misleading activity in the marketplace, is believed to be rampant across crypto exchanges. Furthermore, false or misleading information about bitcoin is often disseminated. 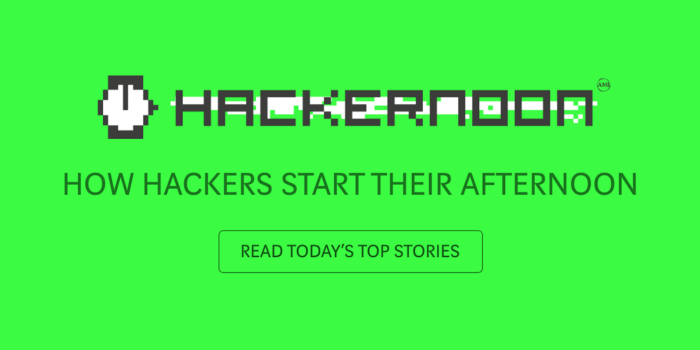 Such events do move markets, as was the case with the bearish misleading news about Korean regulations last January, and the bullish misleading news about Blackrock planning to enter the crypto market. The ETF’s chosen counterparties are registered with FinCEN (Financial Crimes Enforcement Network) as Money Services Business (MSB), and comply with AML & KYC regulatory requirements. However, beyond AML & KYC, counterparties are mostly unregulated (note that the BitLicense is issued by the New York State Department of Financial Services (NYSDFS), and it is a business license mostly centered around AML). Although BZX asserts that it has entered into a comprehensive surveillance-sharing agreement with the Gemini Exchange … the Gemini Exchange is supervised by the NYSDFS, the record does not establish that the Gemini Exchange is a “regulated market” comparable to a national securities exchange or to the futures exchanges that are associated with the underlying assets of the commodity-trust ETPs approved to date. This is meaningful. For example, the SEC has near real-time access to trade data from US national exchanges, which are exchanges registered with the SEC. Similarly, US futures exchanges provide the CFTC with extensive trade data and clients’ data (see this and this). Meanwhile, the CFTC had to subpoena crypto exchanges for trade data, as exchanges refused to provide such data to assist a probe into market manipulation. The exchanges that refused to provide the requested information are Coinbase, Bitstamp, itBit and Kraken, whose prices are used for the CME CF Bitcoin Reference Rate, which is in turn used for the CME bitcoin futures expiry. These are the same exchanges the CBOE proposal mentions as partners. Contrast the ETF proposed by the CBOE to a “regular” ETF. In the latter, Authorized Participants deliver the underlying (stocks, gold, etc.) to a Custodian, rather than cash. Also, Trusts buy the underlying strictly from Authorized Participants who, once again, are mostly registered broker-dealers, such as JP Morgan & Deutsche Bank — companies so heavily monitored that they have their phone lines recorded and chats policed in REAL-TIME. Finally, consider that even though bitcoin and ethereum are not considered securities, the SEC considers most tokens as securities, and thus most crypto exchanges are non-compliant with the SEC. The SEC has specifically said that exchanges that trade securities, including cryptocurrencies that are securities, must register with the SEC as a national securities exchange. The ETF counts Kraken among its potential counterparties — Kraken trades altcoins, many of which would be categorized as securities by the SEC, and is thus non-compliant with the SEC. — -this section will be added later. First, bitcoin markets are still not demonstrably resistant to manipulation. Second, although the Trust does have surveillance-sharing agreements with regulated markets for trading the underlying commodity, these markets are not of significant size. These markets are also mostly unregulated beyond complying with AML & KYC requirements (and are thus in a position to refuse data sharing). Third, the significant markets for bitcoin are currently still unregulated. Therefore, even though the CBOE ETF proposal is vastly superior than prior proposals, this should likely not suffice. Last year two bitcoin futures contracts were listed on CME and CBOE, both CFTC registered exchanges. Both CME and CBOE self-certified that the contract complies with the Commodity Exchange Act (CEA). Self-certifications satisfied the CFTC’s threshold concerns and got the CFTC’s approval. CFTC rules prohibit exchanges from listing contracts susceptible to manipulation and require exchanges to monitor market activity to detect and prevent manipulation in the cash settlement process. Some may thus argue that the CFTC has determined bitcoin markets are not susceptible to manipulation. Yet the CFTC has stated that the self-certification for bitcoin futures “does NOT provide for … value judgments about the underlying spot market”. Exchange Act”. This stance is unlikely to change. The SEC’s rejection is based on the proposed ETF being “inconsistent with Section 6(b)(5) of the Act, which requires, in part, that the rules of a national securities exchange be “designed to prevent fraudulent and manipulative acts and practices to protect investors and the public interest.” The Commission focuses its decision not on the ETP shares to be listed on the exchange but on the underlying bitcoin spot market…The Commission erroneously reads the requirements of Section 6(b)(5). The disapproval order focuses on the characteristics of the spot market for bitcoin, rather than on the ability of BZX — pursuant to its own rules — to survey trading of and to deter manipulation in the ETP shares listed and traded on BZX. Section 6(b)(5), however… says nothing about looking at underlying markets, as the Commission often has done in its orders. The rules of the exchange are designed to prevent fraudulent and manipulative acts and practices, to promote just and equitable principles of trade, to foster cooperation and coordination with persons engaged in regulating, clearing, settling, processing information with respect to, and facilitating transactions in securities, to remove impediments to and perfect the mechanism of a free and open market and a national market system, and, in general, to protect investors and the public interest; and are not designed to permit unfair discrimination between customers, issuers, brokers, or dealers, or to regulate by virtue of any authority conferred by this title matters not related to the purposes of this title or the administration of the exchange. Commissioner Peirce seems to be right. Section 6(b)(5) does not relate to an ETF’s underlying markets, but to the exchange where the ETF is listed. Yet looking at underlying markets is how the SEC has been historically operating. Would the Commission change its approach? Could it be argued that by listing an ETF where underlying markets are prone to manipulation the exchange would be exposing ETF investors to manipulation and thus failing to “prevent fraudulent and manipulative acts and practices” and failing “to promote just and equitable principles of trade”? It’s important to note that the BZX proposal (as well as other bitcoin ETF proposals) was similar to prior commodities ETF proposals. Therefore the SEC evaluated the BZX proposal using the same standards applied to prior commodities ETF proposals. And in prior proposals, the potential for manipulation of the underlying market was a crucial factor for the decision making process. Heston Peirce’s second reason for dissent was that the SEC’s “approach undermines investor protection by precluding greater institutionalization of the bitcoin market. More institutional participation would ameliorate many of the Commission’s concerns with the bitcoin market that underlie its disapproval order”. This is partially true. In line with this line of thinking, the BZX proposal made a comparison with copper, stating that when SEC approved the iShares Copper Trust, “the Commission found that demand from new investors would broaden the investor base in copper and thereby reduce the risk of collusion among copper market participants”. However, the SEC stated in response that “the Copper Order specifically noted the existence of surveillance-sharing agreements not only between the ETP listing market and copper futures markets, but also between the ETP listing market and a significant copper spot market, the London Metal Exchange”. Given this precedent, it would would be rare for other commissioners to ignore their reservations about manipulable unregulated underlying markets and bypass Exchange Act Section 6(b)(5), in order to promote institutionalization that would ameliorate such reservations. True, there would be no faster way to make bitcoin markets less vulnerable to manipulation than opening the market to institutional investors’ liquidity. However, faster is not necessarily better, as “faster” may not comply with pre-existing rules. Bitcoin markets could also be made less prone to manipulation by having most of its constituent exchanges regulated. Institutionalizing bitcoin by approving an ETF is not required for diminishing the effectiveness of manipulative practices. The SEC is required to announce a decision on the CBOE ETF proposal WITHIN 45 days of the date the proposal notice is published in the Federal Register. The decision can be postponed by up to 90 days from filing, then up to 180 days from filing, and then up to 240 days from filing. Such timelines are applicable to all filings with the SEC. The ETF’s notice was published on Jul/2/18, thus the first deadline is Aug/16/18, and the final deadline is Feb/27/19. UPDATE: On Aug/7/18 the SEC announced it is postponing the decision by 45 days, moving the deadline from Aug/16/18 to Sep/30/18. This announcement should have been fully priced-in and represent no news, yet bitcoin markets are so inefficient and grossly uninformed that the market tanked 6% in 90 minutes on the news. To illustrate how much of a non-event this should have been, look at the wording of the SEC’s Aug/7/18 communique postponing the CBOE BZX bitcoin ETF proposal by 45 days (here), and contrast if with the wording of the SEC’s Aug/23/16 communique postponing the Bats BZX bitcoin ETF proposal by 45 days (here). Aside of a few edits, replacing a few names and dates (e.g. CBOE replaced Bats, VanEck replaced Winklevoss) the wording is IDENTICAL. On Mar/10/17 the SEC rejected the Winklevoss ETF seconds before 16:03 EST. 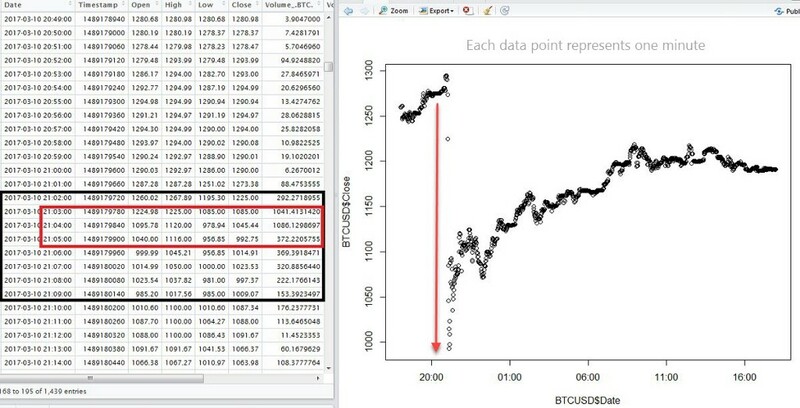 Bitcoin’s price dropped 22% in the following 3 minutes (Coinbase data). March 10, 2017: $BTC drops 22% on the back of the SEC’s Winklevoss rejection. 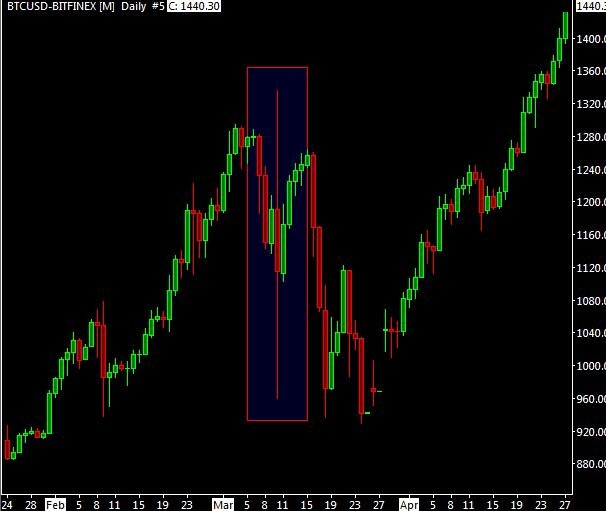 One should expect a large move and continuation once the SEC approves or rejects the CBOE proposal. Yet required reaction time may be as short as one second. The fastest way to learn about such news is having a Bloomberg terminal. For those without one, Twitter is great. 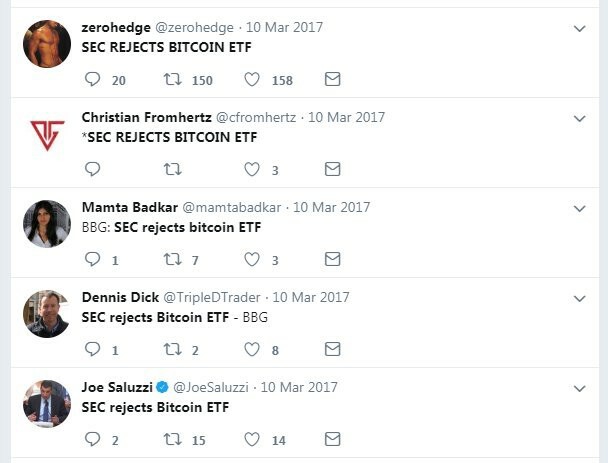 Back in Mar/10/17, the BBG “SEC REJECTS BITCOIN ETF” headline started hitting Twitter at 16:04 EST. Should be noted that the 2017 rejection took place in the midst of a strong bull market, and bitcoin prices quickly recovered. I’d not expect such recovery if the SEC rejects the CBOE ETF. On the other hand, if the ETF is approved, I’d expect strong and uninterrupted continuation. March 10, 2017: $BTC soon continued with its upward trajectory. As described, the SEC’s concerns regarding market manipulation and unregulated bitcoin underlying markets remain. That aside, if/when approved, a bitcoin ETF would represent a very strong bullish catalyst. Markets are discounting mechanisms. Large players with a bullish outlook need to pre-position themselves, as bitcoin’s low liquidity would make it very difficult for a large market participant to enter the bitcoin market at a favorable price once the ETF is approved — if so one should expect a very strong immediate push up. Will the SEC follow its rules and abide strictly by prior practices and by the law as stipulated in Securities Exchange Act of 1934? Helping people make money is not among the SEC’s mandates, is it? Thank you to Jonathan Cheesman for his thoughtful feedback. If you enjoyed reading this, please consider showing your support by clicking on the Clapping Hands button — the more the merrier. Can share the article via the following links: Facebook | Twitter | Reddit | LinkedIn | Whatsapp | Email. You can also follow me on Twitter to stay connected. Thank you. The Bitcoin ETF: breaking down the CBOE ETF proposal was originally published in Hacker Noon on Medium, where people are continuing the conversation by highlighting and responding to this story.